In conjunction with the main Technical Paper Sessions, an exhibition will be held within the conference venue. The exhibition is intended to provide an opportunity for companies, consulting firms, research/academic organizations, and government offices to display and demonstrate their activities, services, or products. 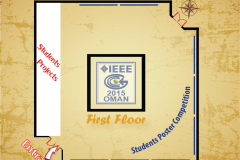 • We have the most attended Electrical and Electronic Engineering Conference in the GCC. • Our exhibition opens throughout the conference duration. 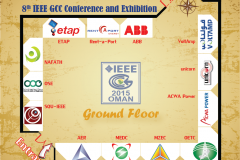 • All of our marketing materials focus on the IEEE GCC 2015 as a top reason to attend. • We expect a total conference attendance of 1,000 as we present our largest technical program ever. Many more will come solely to the exhibition. • We have special events planned inside the Expo Hall attracting customers to you!. • The Expo floor plan set up gives you the opportunity to entertain your customers in a relaxed way. • You can display a photo in our Photo Gallery of your technology or product for all to see!. 1 or 2 representative(s) from each exhibitor shall remain at the exhibition stand. We shall provide them free lunch and coffee breaks during the conference period. A brief resume (8-10 lines) of each exhibitor will be included in the official Exhibition Guide which will be circulated to all invited government officials & V.I.P’s visitor’s and participating delegates. Advertising space will also be available in the Exhibition guide and final Conference program at a special cost. Wide publicity will be given in the Gulf Region about the exhibition to attract Consultants, Contractors and Government officials to visit the exhibition booths during the conference period. This would provide an excellent opportunity for the Exhibitors to receive a large number of public from Bahrain and Other Gulf Countries during this period. Each Exhibitor is entitled to one full conference package at Free of Cost. All conference Exhibitors will be honored during the Conference Dinner. One full exhibition Stand with the above fitting will cost R.O. 1000 for the conference duration, two Stands (R.O. 1,500).